I crave salads. I adore cheese. So for me, few salads – or entrees for that matter – can top the contrasting, yet complementary mix of flavors in a salade chevre chaud (hot goat cheese salad), ubiquitous in France and, actually, much of Europe. The traditional French salad typically consists of large-leaf lettuce (like Bibb or butter lettuce, sometimes with radicchio or other greens) dressed with a light vinaigrette and topped with toasts of baguette or a country loaf brushed with honey and topped with medallions of broiled goat cheese. Just typing the description makes my mouth water! A true French – and definitely not vegetarian – version may have lardons (think chewier, chunkier bacon); sometimes it also will include apples, golden raisins, or other fruits and veggies. The cheese is the crumbly type found in a typical American salad; the stinkier, the better here. I haven’t found a version in the U.S. that quite nails the balance of acidity and butteriness, crisp and chewy, sweet and pungently salty. On a recent extended trip to northern Europe, I had avoided cheese for about a month when I finally gave into my salade chevre chaud cravings on a quick trip to Helsinki, Finland. I don’t know how much the cheese deprivation was a factor, or simply the relief that we managed to find a nice restaurant open for lunch on a Sunday anywhere in the city (especially one that was filled with locals), but I absolutely loved this Scandinavian version of the classic. This particular version featured a variety of leafy greens and nicely broiled and browned medallions of goat cheese with melting centers atop the baguette toasts. What made it unique was the introduction of pumpkin, beets, and pumpkin seeds. The sweetness of the roasted root veggies nicely complemented the pungent cheese. Since I can’t turn down Scandinavian black bread, I ended up scraping some of the goat cheese off of the baguette toasts and eating it instead with a side of the sweet, dense black bread. What is black bread, you ask? Oh, I definitely will share more on that in a future post! Pumpkin, beets, and pumpkin seeds add an interesting take on this salad. Weeks after this Scandinavian experience and while visiting Belgium, a brush with the greatness that is the classic French version inspired me to create my own version. The result couldn’t top a few of the restaurant versions, but I was more than satisfied with my eclectic – and a bit more nutritious – version. Call mine a slightly Californian take on the salade chevre chaud. Arugula, my favorite green, and sprouts formed its base. Arugula, also known as rucola and rocket, is my go-to green for several reasons: its small size and lack of stems ensures it needs no chopping or tearing apart, its texture is free of the stryofoam-like quality of radicchio or romaine stalks, and its flavor is earthy and mild (it is often described as peppery, but I disagree). To the base, I added slices of avocado and prepackaged, tandoori-spiced cooked chicken (hey, it wasn’t my kitchen!). I thinly sliced a seeded, whole-wheat demi-baguette to create small rounds, topped them with divided medallions of a very soft, creamy goat cheese with rind, and broiled the toasts for 5-10 minutes. From two attempts, I learned the importance of going easy on the cheese, as the already oozy cheese at room temperature goes sci-fi under heat. Translation: as it melts even more, it will ooze everywhere you don’t want it! I whisked together a very light vinaigrette with what my friend had on hand: white wine vinegar, stone ground whole mustard, pinches of salt and sugar, and extra-virgin olive oil. The standard ratio of oil to acid in most vinaigrettes is two parts oil to one part vinegar. I prefer higher acidity and don’t like a lot of oil and fat, so mine was probably closer to the opposite ratio. The finished product (photo in header) was devoured way too soon. The right goat cheese makes all the difference. Use a soft cheese with a rind and not the crumbly, semi-soft variety most of us are familiar with. The latter is great for breading and frying, but it will not melt, and the flavor doesn’t quite work. 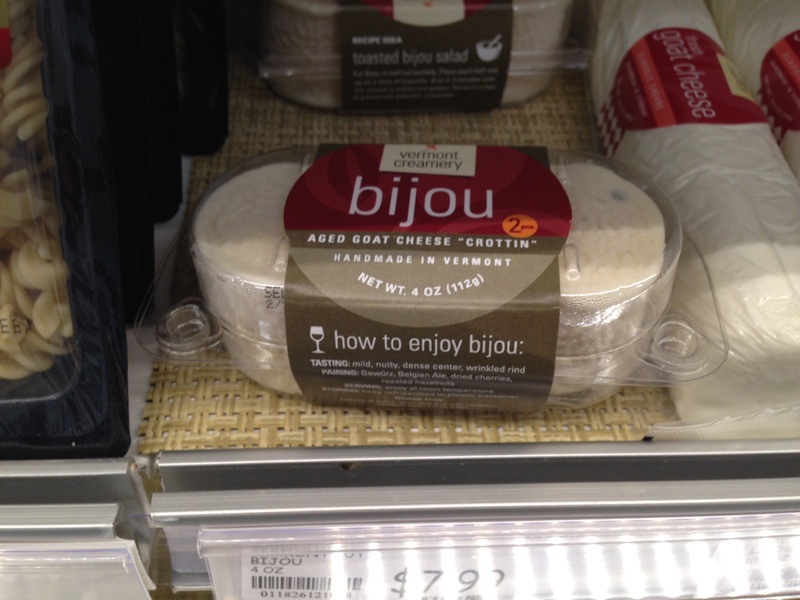 You’ll find this type of cheese closer to the gourmet cheese counter – look for rounds instead of ovals/logs of cheese and think double creme, like brie. The best are so rich and pungent that your refrigerator will smell like something died inside – yes, that’s a good thing. Just use and serve immediately. The broiling will soften some of the edge of the flavor and odor. Ask a store employee for help in locating one. If you have access to a Whole Foods Market in the U.S. or U.K., you will have no problem doing so. Pictured here is a prepackaged variety I found in a local Washington, D.C. My Organic Market (known as the MOM). This pre-packaged goat cheese is marketed just for melting. It is a bit pricy, but a small amount goes a long way. Create the toasts: Thinly slice white or wheat baguette. I prefer whole-grain for added flavor and nutrition. You need not toast the bread before adding the goat cheese; 5-10 minutes under the broiler as the cheese melts will crisp the outside edges of the bread, while leaving the interior soft. Also before adding the cheese, brush or drizzle honey over the bread to create an ‘authentic’ French flavor of sweet and salty. You might also consider adding a touch of honey to a homemade vinaigrette. The salade chevre chaud is all about contrasting flavors. So try out your own favorite salty and sweet additions to the salad: dried fruit, bacon, salted nuts or seeds, or even sweet root vegetables. Balancing between the two is key. So give it a try yourself! Please share your own variations and photos here. Bon appetit! Previous Post New Year’s Resolution: Eat Latvian honey cake! Next Post Pop-Tarts: Hate to love them or love to hate them?